These charts show how eye-wateringly polluted India cities are. Delhi is the reigning king of polluted cities in the world, of that there is little doubt. So grimy is its air today that there are calls for closure of schools when pollution levels are particularly harmful. According to a recent World Health Organization report, the capital has six times the levels of airborne particulate matter than are considered safe. Other cities in the country are only slightly better off. 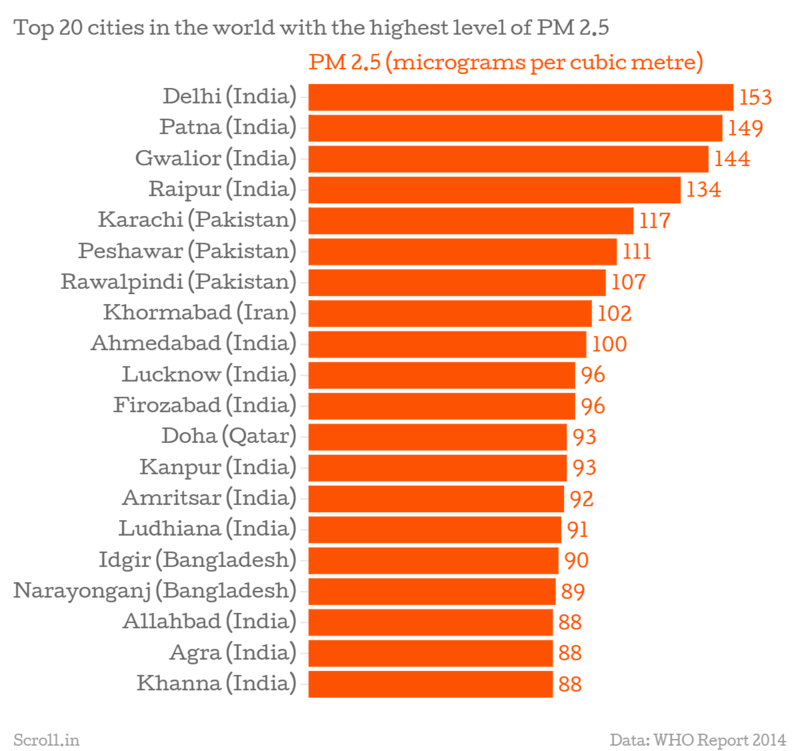 The same WHO report reveals that 13 of the 20 most polluted cities in the world are in India. The report ranked cities after studying their air for the presence of harmful gases, such as nitrogen dioxide, carbon monoxide and sulphur dioxide, besides particulate matter 10 and 2.5. Particulate matter (or small airborne particles) is among the most detrimental of these pollutants. Studies link it with increased rates of chronic bronchitis, lung cancer and heart disease. The WHO advises that fine particles of less than 2.5 micrometres in diameter (PM2.5) should not exceed 10 micrograms per cubic metre. At the top of the WHO ranking, Delhi had 153 micrograms of PM2.5 per cubic metre. Not far behind were Patna with 149 micrograms, Gwalior with 144 micrograms and Raipur with 134 micrograms. The other Indian cities in the list included Ahmedabad, Lucknow, Kanpur, Firozabad, Amritsar and Ludhiana. Of the seven non-Indian cities in the rankings, three were from Pakistan. Karachi had 117 micrograms of PM2.5 per cubic metre, Peshawar had 111 micrograms, and Rawalpindi had 107 micrograms. Though airborne particulate matter between 2.5 and 10 micrometers in diameter (called PM10) are less hazardous than their smaller cousins, they are nevertheless harmful. In Delhi, according to the WHO report released in May, PM10 levels stood at 486 micrograms per cubic metre. In Gwalior, the levels were 329 micrograms and in Raipur 305 micrograms. Lucknow (219 micrograms), Firozabad (219 micrograms), Kanpur (212 micrograms), Amritsar (210 micrograms) and Ludhiana (207 micrograms) also feature on the list. Compared to other major cities in Central and Southeast Aisa, Delhi is way ahead on the list.